I first made Lucia Cats after seeing jg's blog entry in December 2005. 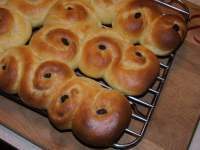 Lucia Cats (sweet saffron buns ) are traditionally served in Skandinavia on 13 December, St. Lucia Day. But we like to serve them on Christmas Day.... Many thanks to jg's mother for sharing her recipe. Here is my rendition of it. Bring the water to a boil. Cut butter into pieces into a mixing bowl large enough for the dough to triple. Pour ¾ of the boiling water overtop to melt the butter. Stir milk powder into melted butter mixture. Put saffron and a bit of the sugar into a mortar and use the pestle to grind the saffron finely. Add the rest of the sugar, saffron, ½ an egg. Stir. Then mix in almost all of the flour and salt until the dough pulls away from the sides of the bowl. Sprinkle a little of the leftover flour onto a board. Turn the dough out onto the board. Wash and dry the mixing bowl. Knead the dough until smooth and shiny (about 10 minutes). Use your dough scraper to keep the board clean. Add a little more flour if the dough seems sticky (but try not to add too much - the dough should be soft). After the dough has doubled, scatter a little flour onto the board. Turn the dough out onto the board. Fold it in half, pat it down and fold in half again and pat it down (or knead it a couple of times). Divide into 12 equal pieces and form into ropes. Make Lucia cats or other shapes. Place the shaped buns well apart (note that the buns were too close together for the photographed version) on parchment covered baking sheet. Optionally decorate each bun with raisins. Cover with a clean tea towel and allow to rise in a warm part of the kitchen to double (20-40 minutes). Preheat oven to 400F. Just before putting them in the oven, brush the tops of the shaped buns with cream (or use the other half of the egg). Place buns on upper shelf (to prevent burning on bottom). Immediately turn the oven down to 375F and bake for 10 - 15 minutes til hollow sounding on bottom. Let the buns cool completely on a rack before serving. If you like to serve them warm, reheat for a few minutes at a low temperature. These buns are traditionally served without butter. But they are delicious with or without butter, with or without honey. They are also great with eggs for breakfast. And don't forget to have plenty of good strong coffee on hand too. Saint Lucy of Syracuse (284-304), also known as Saint Lucia, Santa Lucia, or Saint Lukia, [...] Patroness of Syracuse, also the principal Catholic representative of the patron saint of the blind and those with eye-trouble; Protector of Eyesight; also patron saint of Opticians, Ophthalmologists and Firemen; the patron saint of the sailor [...] The chosen feature of her sainthood is not, however, the martyrdom itself, but a previous incident. It was said that her lover had so greatly admired her beautiful eyes that she felt it was a sin. The legend continues, "considering these things and calling to mind the words of Christ, 'If thine eye offend thee, pluck it out and cast it from thee,' and fearing lest her eyes should be the cause of damnation to the young man, she called for a knife and took out her eyes and sent them to her lover in a dish with these words; 'Here hast thou what thou so much desired.' Whereat the young man became utterly astonished and full of grief and remorse became also a convert to Christ. God would not suffer that the blessed Lucia, having given proof of her courage and piety, should remain blind, for one day, as she knelt in prayer her eyes were restored to her more beautiful than before." blog from OUR kitchen - Merry Christmas! blog from OUR kitchen - Lucia Cats - really late or really early?